Describe acceptable behaviors with words and actions. BE specific. Describe the levels of noise for the various activities. should be talking to at group times. voice levels and when they are to be used. something they could be doing to improve their behavior. 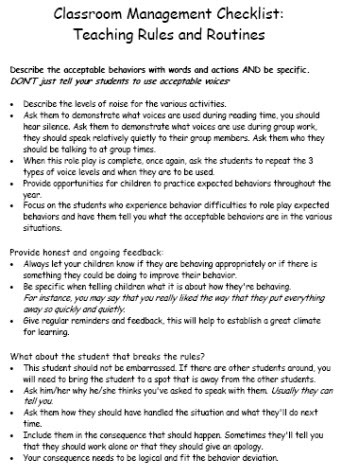 Be specific when telling children what it is about how they're behaving. away so quickly and quietly. What about the student who breaks the rules? will need to bring the student to a spot that is away from the other students. that they should work alone or that they should give an apology.